Matthew is Healthy Now. No More Icky Medicines! Matthew’s cardiology appointment today went very well. His echocardiogram showed that his heart is doing very well. He still has a tiny “pin-hole” VSD that is not causing any problems and will most likely close on its own over time. The VSD “patch” that Matthew grew himself is actually thicker than the ASD patch the surgeons put in. The doctor said, “Look how much tissue is in that VSD area!” His left ventricle is still normal-size, and the aorta still looks good. And, the mitral and tricuspid valves are functioning very well. Since Matthew’s heart is so strong, and he no longer has any signs of fluid retention, he no longer needs any of his medication! We will follow-up with the cardiologist in 6 months, then see them once a year after that for routine follow-up. So . . . that’s it! That’s the end of Matthew’s medical interventions. It is incredible to be finished. Finished with feeding tubes, finished with oxygen. Done worrying that my son will stop breathing and eating with every little virus. All done with surgery, no more “sternal precautions” or being home-bound for fear of germs. And now, we’re all done trying to disguise the icky taste of Matthew’s medications in his formula. I think you’ll see why meeting them has been such a blessing. Libby shares her thoughts and feelings very eloquently, and her feelings echo my own in so many ways. We are very thankful that Matthew has a friend – someone like him with whom he can share experiences, struggles, and triumphs. I am even more thankful that I have a friend like Libby – a mom very much like me, who understands. Matthew’s appointment with our pediatrician went very well on Wednesday. He’s up to 15lbs, 1oz! 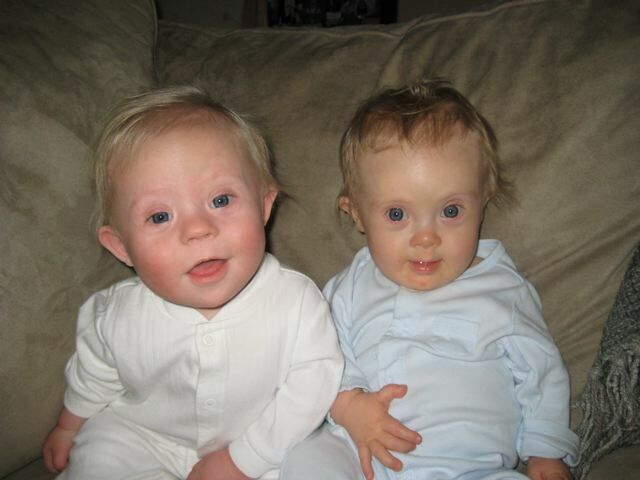 That is good growth, and puts him within the “normal” range for boys with Down Syndrome. She was very pleased with his development, too. He grabbed her thumbs and pulled himself up to standing, and she said, “That’s normal development for any 10-month old! Way to go, Matthew!” She is also setting us up with Children’s Villiage here in Yakima, to evaluate Matthew to see if he would benefit from any special speech or physical therapy. Even since Wednesday, Matthew has continued to develop at an amazing pace. He is quite mobile now, and can move all over the place by moving a pivoting. Aaron and I have both been surprised by how well and how quickly he can do this! He’s started to get up on his hands and knees more, too. I really think he’ll be crawling before we know it. Both the boys came down with a cold over the weekend, though. (We spent the weekend up at Snowqualmie pass with some friends – I will write more about that and add some pictures later.) Micah is doing well, but Matthew is pretty fussy and miserable. This is his first cold since surgery, though, and the first time we can just say, “Oh well – he has a cold, poor guy.” This is the first illness that he hasn’t needed oxygen and a feeding tube – and the first time that we haven’t feared that this virus could take his life. Yes, he has a cold, but he’ll be o.k. We have our appointment with the cardiologists this afternoon, and will let you know what we learn. 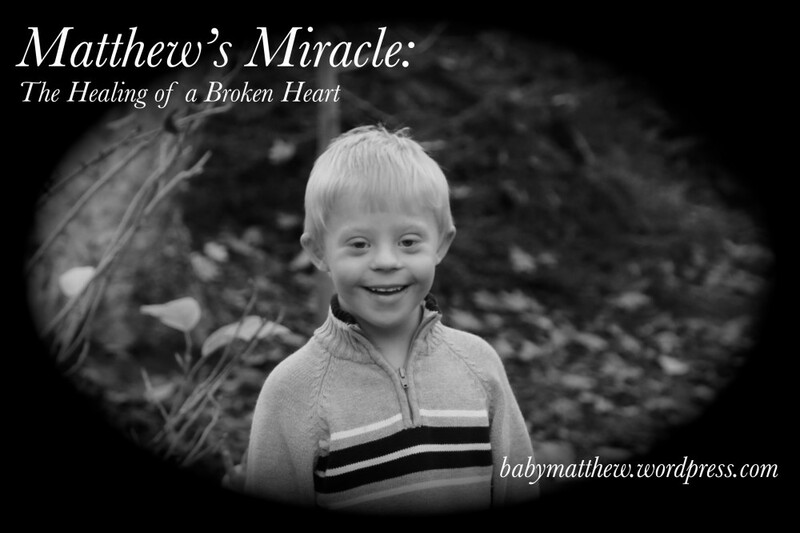 I realize it has been awhile since I have written specifically about Matthew’s progress. It seems like we’ve been SO busy lately – and much of that is due to the fact that Matthew is SO BUSY these days! It’s hard to believe it has been only a little over 2 months since he had open-heart surgery. Our fragile, weak, and sickly baby has turned into a healthy, active little guy! My uncle recently asked me, “How long after surgery did you notice a difference in Matthew’s activity level?” I told him it was only 3 days. The day after they removed his chest tubes, he was a different baby – eating better than ever, more alert and seemed more energetic than ever – and he has continued to progress at an amazing pace ever since. He is an incredible eater now. It’s hard to believe we’re feeding the same kid that needed feeding tubes and hours of coaxing to take his bottle. He eagerly eats anything we put in his mouth, and reaches for . . .no, lunges for . . . anything we’re eating. He can put away 2-3 jars of baby food per day, along with some finger-foods and tiny bites of our table foods. (I don’t remember Micah ever actually finishing a jar of baby food!) He loves to hold his cookies or teething biscuits and chew on them – anything he can hold and feed himself. He can reach for and grab his finger-foods, but getting them into his mouth is another challenge. I would guess that about 1 in 5 puffs actually makes it into his mouth. He eats in a high chair, and does a good job sitting up in it with the help of some rolled-up towels for support. He definitely tells us when he’s hungry now. He eagerly and quickly drinks a bottle of formula, and can down 6-8oz first thing in the morning! Matthew can sit up on his own for very brief periods of time. He generally doesn’t like to sit, because he wants to GO. He falls out of the sitting position because he’s reaching for a toy or book (or brother). When he’s on the floor, he can pretty much get to whatever he wants by rolling or pivoting. He can push himself up using his arms, and he kicks his little legs like he’s trying to swim across the floor. He kicks his legs quite a bit – whenever he’s happy or excited or wanting to move. I don’t think it will be long before he crawls! He can hold onto your thumbs and pull himself up to a sitting or standing position. And, once he’s standing, using only your thumbs for support, he will pull and push himself back and forth, grinning the whole time. He’s playing little games with us, like “coughing” to get a reaction from us. He will also make noise and use his forearm to go up-and-down across his lips to create a bubbling sound. He loves toys and books, and will let you know if it falls out of reach or if brother takes one away! 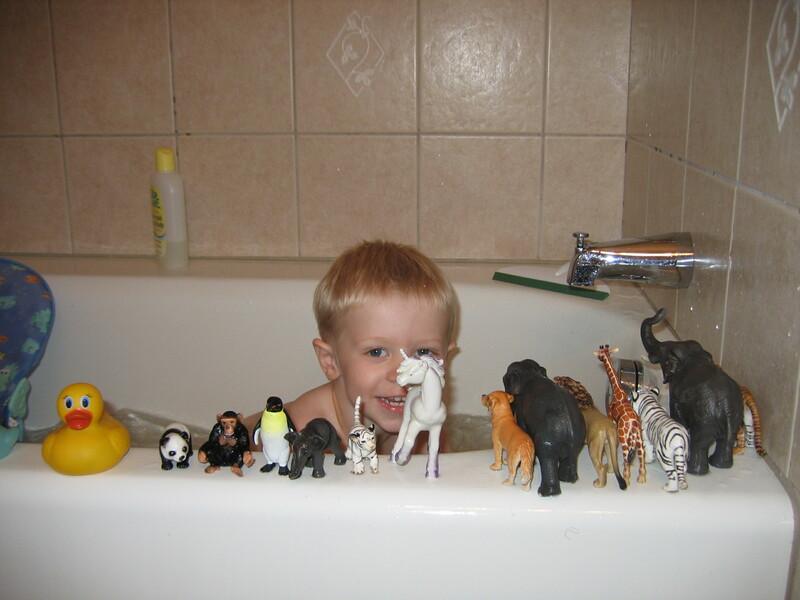 He still loves the water, and loves his bath, but it is getting more difficult to give him a bath! He wants to be on his tummy in the water so he can bat and splash, and he is SO strong that I can put him on his back, and can’t keep him there! He twists and turns to be on his tummy, then has a grand ol’ time. I just do my best to keep the tasting of the bath water to a minimum. Matthew is definitely Daddy’s boy – more than Micah ever was. Whenever Aaron is is the room, Matthew’s eyes are on him. When he sees Aaron or hears his voice, Matthew really perks up and grins. Aaron gets the best smiles by far. Matthew really has eyes for his Daddy – and they are big, beautiful, crystal-clear blue eyes. We have an appointment with Matthew’s pediatrician on Wednesday, and then an appointment with his cardiologist on Monday. The cardiologist will do another echocardiogram, and if everything looks good we may be able to get Matthew off his medications. So, as you can see, Matthew is really doing incredibly well. We’re so proud of him, and so very happy to have him as part of our family. Thank you again for all of your prayers. We really believe that it is because of all those prayers that Matthew is with us and doing so well. Praise God, and Thank You for Your Miracles! I just have time for a quick post tonight, but will write more soon. Life has been very, very busy! The boys and I had a very nice 4th of July weekend in Walla Walla. Unfortunately, Aaron had to work all weekend and could not come along. Micah enjoyed digging garden potatoes, picking fresh raspberries, blackberries, and cherries, and playing on Grandpa’s swing set. 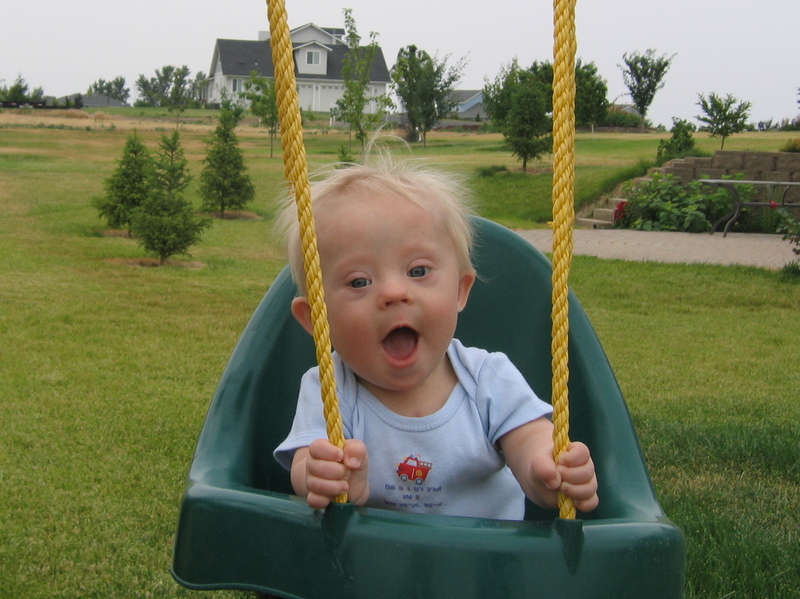 Matthew was even big enough to enjoy the swing this time!